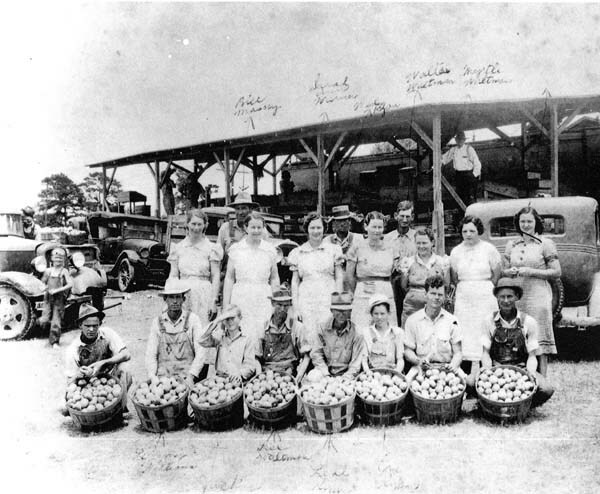 During the 1930s a tomato packing operation operated adjacent the railroad tracks near the depot. First row: Brink Stringer, T. C. (Lummy) Williams, Jack Bourous, Lee Waltman, Leal Ryan, Joe Ryan, Nelson Grimes, and Buford Smith . Vivian Ryan, Matte Bell Lee. During the Depression the WPA ran a cannery across the road north of Burke School.